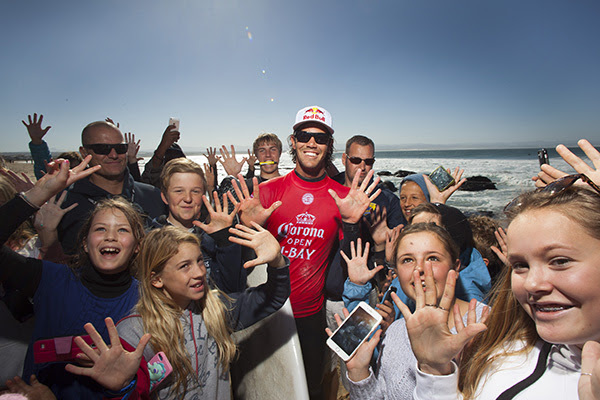 Jordy Smith (ZAF) posts the 10th Perfect 20 in history in Round 3 of the Corona Open J-Bay. JEFFREYS BAY, South Africa (Tuesday, July 18, 2017) – A sensational day of action played out at the Corona Open J-Bay, stop No. 6 on the 2017 World Surf League (WSL) Championship Tour (CT), and the world’s best surfers delivered four perfect 10-point rides. Competition ran through Round 3 and the opening two heats of Round 4 in epic 8 – 10 foot wave faces at Jeffreys Bay. 12 surfers were eliminated from the competition in Round 3 and the remaining 12 battled through incredible conditions in Round 4 for a direct advance to the Quarterfinals. The two-time event winner (2010 and 2011) and current No. 3 on the Jeep Leaderboard Jordy Smith (ZAF) from South Africa posted a PERFECT 20 heat total in his Round 3 match-up with 2017 WSL Rookie Leonardo Fioravanti (ITA). This is only the 10th time the feat has been achieved in 40-plus years of professional surfing, the first time anyone has earned a Perfect 20 at J-Bay and the first ever perfect heat for Smith. Despite a strong opening from Fioravanti, the hometown hero found the best waves of the heat to deliver two perfect rides. First Smith laid down two huge turns and a deep barrel for 10 points followed quickly by a display of his incredible power surfing and two more barrels for another Perfect 10 to seal his victory and his place in the history books. Jordy Smith (ZAF) celebrates his perfect heat. An unbelievable clash played out in Heat 2 of Round 4 between reigning WSL Champion John John Florence (HAW), three-time WSL Champion Mick Fanning (AUS) and Frederico Morais (PRT). The rookie opened with a near-perfect 9.60 for an early lead but Florence stormed into first place with his first Perfect 10 of the year. Morais came back with another big score, a 9.47, and reclaimed the top spot while the four-time event winner put on a clinic and locked in an excellent 9.73 to get himself back in the heat. The two world champions could not better their scores and the rookie won the heat and claimed his place in the Quarterfinals. Fanning and Florence will surf again in Round 5 when competition resumes. 2014 WSL Champion Gabriel Medina (BRA) battled Owen Wright (AUS) and 2017 WSL Rookie Joan Duru (FRA) in the Round 4 Heat 1 in an all goofy affair. Wright was the first surfer to go into the excellent range but Duru, looking to break into the Quarterfinals for the second time season, stole the advantage. After a slow start, Medina found two barrels and a series of incredible turns for a 9.07 and the lead. Duru continued to hunt down the 8.91 required but a big ride in the final minutes of the heat fell short and the Brazilian took the heat win with an excellent 9.67. Wright and Duru will surf again in Round 5. Rookie Duru previously caused a big upset in Round 3 when he put a serious dent in Adriano de Souza’s (BRA) title campaign and eliminated the Brazilian in a rematch of their 2012 Qualifying Series final at Jeffreys Bay. Both of the surfers had plenty of opportunities, but it was Duru who found two solid seven-point scores that the 2015 WSL Champion was not able to match and he is sent home in 13th place. Earlier in the day Round 3 saw its share of big scores with Julian Wilson (AUS) posting a Perfect 10 of his own in his heat against Jeremy Flores (FRA). The Australian, currently in 8th place on the Jeep Leaderboard, is yet to make it past the Quarterfinals this season and today’s third round victory is a step in the right direction. Conner Coffin (USA) also delivered big scores and posted two excellent nine-point rides in the opening 20 minutes of his Round 3 heat to eliminate 2012 WSL Champion Joel Parkinson (AUS) from the competition. The two-time event winner and current No. 6 on the Jeep Leaderboard was left in a combination situation and is sent home with his second 13th place finish of the year. No. 1 on the Jeep Leaderboard, Matt Wilkinson (AUS), also made it through Round 3 by defeating Jack Freestone (AUS) in Heat 12 with a 16.54 heat total. Only two rookies remain in the draw after Fioravanti, Connor O’Leary (AUS) and Ezekial Lau (HAW) failed to make it through elimination Round 3. Duru will surf again in Round 5 against Fanning for his chance to join Morais in the Quarterfinals. Heat 3 of Round 4 was called off following a shark breach that was part of a larger feeding activity that was going on and, per protocol, the response team was activated and the heat was called off. Event organizers will reconvene tomorrow morning at 7 a.m. local time to assess conditions and make the next call. Good size SW/SSW swell will drop off through Wednesday, with the strongest waves expected for the earlier morning (and still fairly solid). We’re tracking an even stronger swell that should rapidly build in through the day on Thursday before fading Friday. Favorable wind on Thursday may trend onshore Friday. The final two days of the waiting period- Sat and Sun- look likely to see much smaller leftovers. Surfline.